A tax-advantaged SIP is a type of share ownership plan that encourages employees at all levels to acquire shares in their employer company or its parent company. SIPs can give you generous tax advantages if the conditions are satisfied. Companies can choose what to include in their plans. Most often, these plans offer you the chance to buy shares using money deducted from your pay. They can also offer shares you don’t have to pay for. One company’s SIP can be very different from another’s. And it might not even be called ‘Share Incentive Plan’. SIPs may be called by different names – for example, a plan that is called Buy As You Earn Plan or Employee Share Ownership Plan could still be a tax-advantaged SIP. The company will tell you if the plan is a tax advantaged SIP and give you some information about the plan that they are offering. If you are eligible, you will be offered the opportunity to join, but you don’t have to, it’s your choice. If you join, a plan trustee will hold real shares on your behalf and keep them safe for you while they are in the plan. It’s not like an option plan, where you don’t actually own any shares until you have exercised your option. The tax advantages under the SIP depend on how long your shares are in the plan. If you leave, the tax treatment and the number of shares that you can keep may depend on the reason for leaving. Your shares have to come out of the SIP if you leave. So what might a SIP offer? The chance to buy shares in the company. The shares you buy are called Partnership Shares. The real cost to you is less than if you bought them in the market. That is because the money to pay for them comes out of your pay before any income tax or national insurance contributions have been taken off. If this is a bit confusing, you could think of it as the tax man paying some of the cost of the shares for you. There can be situations where tax applies when your shares come out of the plan (see below). The chance to get some shares free, depending how many you buy yourself. These shares are called Matching Shares. You normally have to hold Matching Shares throughout a Holding Period of at least 3 (and in some cases up to 5) years. There can be situations in which you lose your Matching Shares (see below). If your company offers Matching Shares, that means you can get more shares for the money you pay. Free Shares. The SIP rules let companies offer shares completely free, without having to buy any out of your own money – but you normally have to agree to hold them throughout a Holding Period, at least 3 (and in some cases up to 5) years. There can be situations in which you lose your Free Shares (see below). Not all companies offer Free Shares at all. Some only offer Free Shares if the company achieves certain performance levels- a bit like a share bonus with extra potential tax benefits. The ability to use dividends on your SIP shares to buy more shares. There is no tax on the dividend when it is reinvested through the SIP. The shares you buy with dividends are called Dividend Shares. There can be situations where tax applies later (see below). As you would expect, the tax rules have limits on the amount companies can offer through the SIP and there are limits on how much of your pay you can put into the SIP. The plan rules have to follow some detailed conditions set out in the legislation and there are some detailed tax provisions that work differently, depending how long your shares have been in the plan. What do you have to agree to? You will have to agree to various things if you want to join your company’s SIP. Before you agree to join, you should read carefully the information that the company provides, because that will explain the type of SIP that your company is offering. The information on this website can only be very general. A SIP will involve you owning real shares. Obviously you need to know what you would be signing up to before you decide to go ahead- even more so if you are going to be using some of your pay to buy shares. Shares are regarded as a longer term investment and investing in shares carries risk that the shares could go down in value. If you can’t afford to take this kind of risk, even if the risk is cushioned because of how the tax reliefs work, you might not choose to buy shares through your company’s SIP. Ask you to agree how much money you want to invest in the SIP. Usually the money is deducted monthly (or weekly) from your pay, but sometimes there is the opportunity to have the money taken in one lump, for instance if you get a bonus. Usually the plan says that shares will be bought for you each month. Sometimes the plan provides that the money taken from your pay is accumulated for a set period and then spent on buying shares for you – if this happens the agreement will set out how the share price will be worked out. Set out whether any Matching Shares are to be offered if you buy Partnership Shares and how long you have to hold onto your shares in the SIP to avoid losing your Matching Shares. Matching Shares will be subject to a Holding Period. Explain that if you are on a low income, paying into the SIP might affect certain statutory benefits. SIP money gets taken from your pay before national insurance deductions, and some benefits depend on how much national insurance you have paid in. Pay that is used for the SIP still counts when you work out your pay for pension purposes. Confirm you understand that shares can go up in value or down in value. It’s possible that shares you have bought through the SIP could fall in value to a level that means you are out of pocket- although obviously that’s not what the company is hoping. Agree that in certain circumstances if you leave or if you take your shares out of the plan you will lose some or all of the tax benefits. After 5 years your SIP shares are tax free and after 3 years there is an element of tax protection. The company will usually set out some worked examples – you should read them. Agree how any dividends on your plan shares will be treated. Sometimes they are paid in cash, sometimes they are automatically invested in more shares, called Dividend Shares, which are held in the plan and sometimes the plan lets you choose the dividend treatment you prefer. Confirm you understand and accept any relevant Holding Periods and what they mean. Agree what happens to your plan shares if you leave. They have to come out of the plan. Depending when and why you leave, some shares may need to be sold to sort out taxes and you may lose or ‘forfeit’ some or all of your shares. Often the plan says that unless you give other instructions the plan administrator will sell your remaining plan shares (remember, some of them might be taken off you if you choose to leave early) and pay you the cash. Agree to the detailed terms of the plan and its administration. This includes agreeing that the plan trustee will hold your shares for you and agreeing how you come out of the plan if you want to. Holding Periods are relevant to Free Shares and/or Matching Shares. The plan must provide for a Holding Period of between 3 and 5 years when Free Shares and Matching Shares cannot be withdrawn from the plan unless you leave. The company will tell you how long they have made the Holding Period. The plan may also provide that in certain circumstances if you leave, or take your partnership shares out of the plan within a ‘forfeiture period’ you could lose your Free Shares or Matching Shares. If there is a forfeiture period, it can’t be more than 3 years. The company will tell you if there is a forfeiture period. If you leave early, you may lose your Free Shares. If you leave or you remove your Partnership Shares from the plan early, you may lose your Matching Shares. SIPs have different rules about whether you lose your Free Shares and your Matching Shares if you leave, depending whether or not you are a ‘good leaver’. You won’t lose your shares if you leave for a ‘good leaver’ reason (see below). After the end of the Holding Period, you can choose whether to take your shares out. You don’t have to. You can leave them in the plan where they will continue to get tax benefits. The full tax benefits are only available after shares have been in the plan for 5 years. Dividend Shares are subject to a Holding Period. The Holding Period for Dividend Shares must be 3 years. If you leave, you won’t lose your Dividend Shares but there may be some tax to pay. Partnership Shares are not subject to a Holding Period. You can take them out early if you want to. If you leave, or take your Partnership Shares out early, you won’t lose your Partnership Shares but there may be some tax to pay. How are SIP shares taxed? The tax information on this page is about the special rules that apply to SIPs. For other tax information, click through to our Tax page. what kind of SIP shares they are. Are they Partnership Shares, Matching Shares, Free Shares or Dividend Shares? How long have they been held in the Plan? After 5 years you can take any kind of SIP shares out of the Plan tax-free if you want to- although once out of the Plan they stop being protected from tax. Before that, the rules in the first 3 years are different from what happens in years 3 to 5. Why are the shares coming out of the SIP? If it is for a SIP “good leaver” reason or because of certain corporate events, tax advantages may apply even if your shares are coming out early. 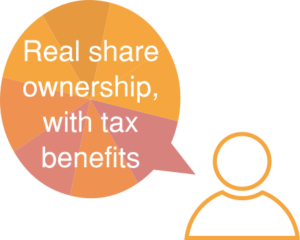 How does the tax work on Partnership Shares? There is no tax when you get your Partnership Shares. The money to pay for them comes out of your pay before your pay is taxed, which means that no income tax or employee national insurance contributions is taken from the money used to buy the Partnership Shares. You have paid for your Partnership Shares so there is nothing to prevent you taking them out of the plan when you want to – and asking the plan administrator to sell them. But remember, the tax benefits may be lost if you remove your shares too early. Also, if you take out your Partnership Shares early, you may lose the Matching Shares that were linked to them. If you buy shares regularly through the plan then after five years you will have some plan shares where the full tax benefits are available, some that have not yet been in there for the full amount of time and some that have only just gone in. It is the administrator’s job to make sure the correct treatment is applied to the shares in each category. Once shares have been in the SIP for 5 years you can take them out, tax free, if you want to, or you can leave them where they are as the SIP can continue to provide protection from capital gains tax and also potential tax relief on dividends reinvested through the plan. If shares are taken out between 3 and 5 years, you pay income tax and employee national insurance contributions only on the amount of salary deducted from your pay to buy them or, if less, the market value of the shares at the exit date. You do not get taxed on any increase in value. If the shares are withdrawn before 3 years, income tax and NICs are charged on the market value at that time. So if the shares have grown in value you are taxed on the higher value, but if they have fallen in value, you are not taxed on any more than they are worth. It’s not usually your job to sort out the tax, the plan will say that the trustee or the company has to do that by selling some of your shares. Then either the rest of your shares will be transferred to you or held for you outside the plan until you give instructions, or sometimes you agree that they will be sold and you will end up with cash. It is only in ‘good leaver’ situations or certain company events (cash takeovers with no choice to take shares in the bidder, or loan notes) that shares can come out of the plan early without there being at least some tax to pay. How does the tax work on Matching Shares or Free Shares? There is no tax when your Free Shares or Matching Shares first go into the SIP to be held for you. Once shares have been in the SIP for 5 years you can take them out, tax free, if you want to, or you can leave them where they are. The SIP can continue to provide a shelter from capital gains tax and also potential tax relief for dividends reinvested through the plan. If shares are taken out between 3 and 5 years, you pay income tax and national insurance contributions only on the value of the shares when they were first awarded to you or, if less, the then market value of the shares at the exit date.You do not get taxed on any increase in value. If the shares are withdrawn before 3 years, (assuming they are not forfeited) income tax and national insurance contributions are charged on the market value at that time. So if the shares have grown in value you are taxed on the higher value, but if they have fallen, you are not taxed on any more than they are worth. If shares are forfeited, because you left early and it was not for one of the listed ‘good reasons’, or because you took out your Partnership Shares early and had to forfeit your Matching Shares, the shares you lost are just ignored for tax because you never got any benefit from them. What are ‘good leaver’ reasons for SIPs? the business you work for being transferred outside the group (sometimes called a TUPE transfer) or the company you work for being transferred out of the group. If there is a takeover and you are only offered cash for your plan shares, selling them for cash is viewed as a ‘good reason’ for taking them out of the plan. If there is a takeover you might be offered the opportunity to sell your SIP shares for shares or securities offered by the buyer and sometimes it is possible to hold these through the SIP and have the tax advantages continue. Where you have a ‘good reason’ for taking shares out of the plan, you can generally still get the tax benefits offered by the SIP rules, even though you may be taking your shares out of the plan early. What happens about Capital Gains Tax? If you keep your shares in the plan for 5 years, you pay no income tax, national insurance contributions or capital gains tax on either the initial value or any growth in value of your plan shares up to the time they are taken out. There is no capital gains tax when shares are withdrawn from the SIP. If not sold immediately and they go up in value between the time when they came out of the plan and the time when you dispose of them, capital gains tax may be charged on that increase in value unless it comes within your capital gains tax annual exemption. Whether there is any tax to pay depends on your own individual circumstances. If you want, you can leave your shares in the plan for so long as you remain with the company. You don’t have to take them out at the end of 5 years unless you want to. The tax benefits carry on and there is no capital gains tax on the shares whilst they are in the plan. So if you want to build up a holding of shares in the company, it makes sense to keep them in the plan. But the numbers can mount up- you may get to a point where you don’t want quite so much at risk in shares of just one company. What happens about Dividends or Dividend Shares? If dividends on your SIP shares are paid to you in cash they will be taxed just like any other dividends if you exceed the annual dividend allowance. If dividends are reinvested and used to buy Dividend Shares that will be held within the SIP for you there is no tax on the dividends at that point. If you remove the Dividend Shares from the plan within 3 years, the dividend used to buy them may be subject to income tax under the normal rules for taxing dividends. What choices are there after 5 years? After 5 years you can take your shares out tax free if you want to. Remember, if not all of your shares have been there for 5 years you can’t take them all out tax free. Keeping shares in the SIP makes sense if it is part of your investment strategy to build up a holding of the company’s shares, or if you have to build up a certain level of shareholding for other reasons (this is only likely to be a requirement for very senior employees). The reason is that shares in the SIP are tax-protected. It’s possible to transfer shares from the SIP into an ISA. Shares within an ISA are also tax protected. In an ISA you can diversify your investments to spread your risk, you aren’t limited to holding just one kind of share. Usually an investment adviser would advise you to spread your risk over different types of investment depending on your personal circumstances. Transfers within 90 days of shares coming out of a SIP can be made without there being any capital gains tax on any growth in value between when they come out of the SIP and when they go into the ISA. You may decide it would be helpful to speak to a financial adviser- or you can deal direct with some ISA providers if you are sure about what you want to do. It’s possible to transfer shares from the SIP into a registered pension plan. When people do this it is usually into a special kind of pension plan called a Self-Invested Personal Pension Plan (shortened to SIPP, which is confusing!). Transfers within 90 days of shares coming out of a SIP can be made without there being any capital gains tax on any growth in value between when they come out of the SIP and when they go into the pension. It may be possible to get additional pension tax relief (depending on individual limits) on the value of the shares that come out of the SIP and go into the SIPP. In other words, you can get one lot of tax relief when your shares go into the SIP and tax relief again when they go into your pension. Some SIPP providers are set up to help you to make this kind of transfer. Pensions is an area where there are lots of detailed rules and the Government encourages everyone to take individual advice on pension matters. It’s also possible to ask the plan administrator to sell some of your shares for you and pay you the cash- and then you can use or invest that cash however you decide is best. Remember that if the company is publicly traded there may be times when you are not allowed to deal in the company’s shares. What if there is a take-over or other corporate event? The company will provide you with information on the choices you have and the tax position. You should also get the opportunity to tell the plan trustee how to vote in respect of your plan shares when shareholders are asked to approve the takeover or other corporate event. If there is a takeover, the tax position may depend on whether you have to sell your shares for cash or whether you have a choice to take shares in the bidder, or loan notes, which you might choose to continue to hold through the plan until the full tax benefits are available. If you’re not sure what to do once you’ve read the information that is provided to you, you will be encouraged to speak to an adviser at the time. Be careful- the information on this web page is not the same as advice- read this. Your shares are tax free while they are in the Plan. The Plan may offer Partnership Shares, Matching Shares, Free Shares and Dividend Shares. Each kind has its own set of tax rules. You need to know what types apply to you. If you buy Partnership Shares, the money comes out of your pay before it is taxed. This means the shares cost you less in real terms. If your shares come out of the Plan early, tax may have to be paid then. If you leave, your shares have to come out of the Plan. In ‘good leaver’ circumstances, tax benefits can still apply. After they’ve been in for 5 years, you can take your shares out of the Plan free of tax, but you don’t have to - the Plan can continue to offer tax protection. You could consider spreading your investment risk by using an ISA. ISAs also offer tax protection.